The coup toppled Iran’s prime minister after he tried to nationalise his country’s oil wealth from Britain. THE CIA HAS admitted orchestrating the August 1953 coup that toppled Iran’s prime minister after he tried to nationalise his country’s oil wealth from Britain, accordingly to declassified documents. The Central Intelligence Agency’s role in the overthrow of Mohammad Mossadegh has long been known, with the coup haunting relations between the United States and Iran six decades later. But George Washington University’s National Security Archive — which obtained the documents under the Freedom of Information Act, a law that promotes government transparency — said that a secret internal history marked the most explicit CIA admission. “The military coup that overthrew Mosadeq and his National Front cabinet was carried out under CIA direction as an act of US foreign policy,” the document said, using an alternative spelling of Mossadegh. Mossadegh had angered Britain by moving to take over the Anglo-Iranian Oil Company — the predecessor of modern-day BP. The British believed that control of Iranian oil was vital to reviving their economy from the destruction of World War II. After taking office in 1953, US president Dwight Eisenhower voiced more sympathy for the British position than had the previous administration of president Harry Truman which had encouraged the US allies to compromise with Iran. But the CIA history cast the decision in Cold War terms, fearing that the Soviets would invade and take over Iran if the crisis escalated and Britain sent in warships — as it would do three years later alongside France and Israel when Egypt nationalised the Suez Canal. “Then not only would Iran’s oil have been irretrievably lost to the West, but the defense chain around the Soviet Union which was part of US foreign policy would have been breached,” it said. The coup allowed the return of the shah, Mohammad Reza Pahlavi, who became a close US ally. He was toppled in the 1979 Islamic revolution, with the new leadership making hostility to the United States a cornerstone of Iran’s foreign policy. Email “CIA (finally) admits it masterminded the 1953 coup in Iran ”. 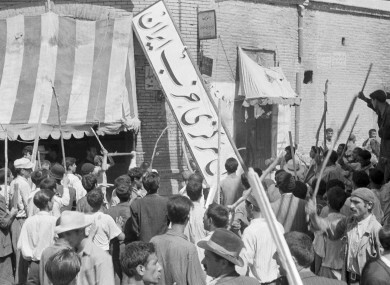 Feedback on “CIA (finally) admits it masterminded the 1953 coup in Iran ”.